Shakespeare is always a great source. Banquo’s ghost, the weird sisters, Lady Macbeth after the murder, Hamlet’s father, the drowned Ophelia–all are classics. If you need visual inspiration, search these characters in ARTstor to see how artists have represented them. Charles Dickens wrote some of the coolest ghosts. Check out Arthur Rackham’s drawings of Marley and the Christmas spirits in the Internet Archives’ digitized A Christmas Carol. 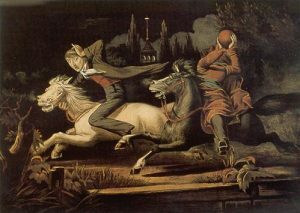 How about the headless horseman of the Legend of Sleepy Hollow? Don’t want to play the villain? Then, perhaps Rip Van Winkle, the lanky, superstitious schoolmaster who falls prey to the horseman. Or, check out the 1999 film version for post-trick-or-treat viewing with friends. Start with the Roger Corman movies for ideas. 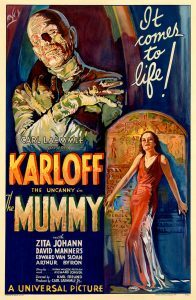 You can even build a theme party around many of his stories, like my personal favorite, The Masque of the Red Death, or the Fall of the House of Usher. Go for an ancient throwback, way back to the Fourth Dynasty (26th c. B.C.) with The Mummy! : A Tale of the Twenty-Second Century in Three Tales (1828). Since we’re going back that far, journey to Greece as an evil Titan in Theogony. If you prefer something more fashionable: be a beast in the romantically scary La Belle et la Bête (1740). i.e. Beauty and the Beast. If all else fails, toss a sheet over your head and materialize as a ghost from The Haunting of Hill House. Want to be heard, and not seen? The Invisible Man is the perfect costume for the occasion! Actor Bela Lugosi as Dracula; anonymous photograph, Universal Studios, 1931. Of course, it wouldn’t be Halloween without a proper Frankenstein or Dracula costume. Bram Stoker is the legendary Irish author who composed the famous epistolatory novel Dracula (1897). 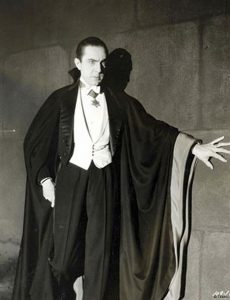 The legacy of Bram Stoker‘s works have continued in the recently published books by his great-grand nephew Dacre Stoker. This costume may take a bit of work, but it’s worth taking the time to put together. A screenplay based on a novel, Nosferatu (a 1922 German silent horror film) was an unsanctioned spin off of Stoker’s Dracula. If you take the literary path this Halloween, send us a picture and we’ll feature it in a future blog!